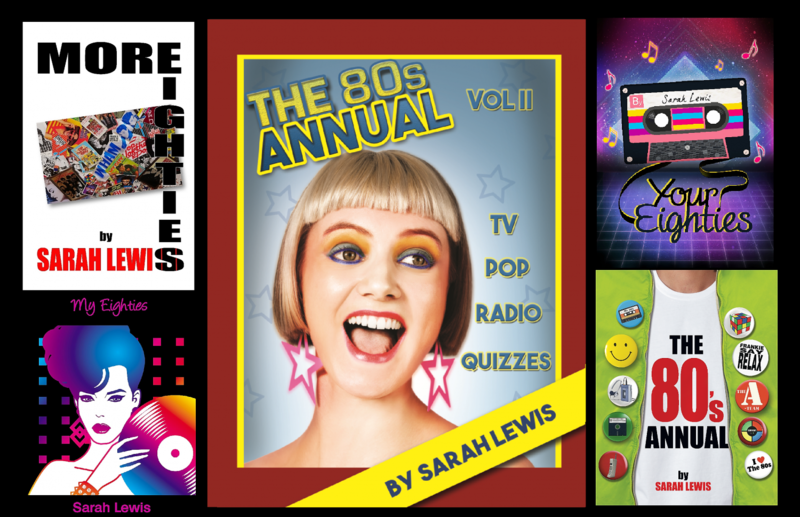 The Favourite Five feature on the My 80s radio show, in which my special guests choose their five favourite songs from the Eighties, is proving popular with listeners. All My 80s shows are uploaded to Mixcloud, but just to make things a little bit easier when searching for a particular show, I’ve listed the shows by guest below. Happy listening! I can’t believe it’s almost that time of the week again when I take to the airwaves to bring you two hours of music and memories from the Eighties. Tomorrow night will see My 80s show number 6 broadcast on Radio Cabin, and another guest choosing his Favourite Five 80’s tracks. The feature was originally intended to appear on the occasional show, but the response from both guests and listeners has been so great that I currently have a Favourite Five lined up for every week until September. So, not only will I be bringing you some interesting chats with some of the decade’s best known artists, but they have also chosen some seriously good tunage! This Thursday, it is the turn of former Frankie Goes To Hollywood guitarist Brian ‘Nasher’ Nash to treat us to his musical magic five. Listen tomorrow night 9-11pm to hear Nasher’s choices, what he has to say about them and much, much more. All past My 80s shows are uploaded to Mixcloud. Guests on previous shows include Soft Cell’s David Ball (Show 5), Musical Youth’s Dennis Seaton (Show 4) and Modern Romance’s Andy Kyriacou (Show 2). Imagine a world where the works and words of Picasso are brought to life through music, performance, dance and poetry, against a backdrop of art representing some of the most recognisable faces in British history. That is exactly what happened last Friday evening at London’s National Portrait Gallery. In a scene reminiscent of the film Night At The Museum, where the past is brought to life in full technicolour and stereo, historical heritage played host to the Picasso-inspired Everything You Can Imagine Is Real. Curated and produced by Martyn Ware for Illustrious, the late shift event drew in an vast and diverse crowd, as eclectic as those performing. Whilst I did manage to catch some of the other 28 acts from the packed programme, such as brilliantly astute poet Luke Wright, I was there for Peter Coyle’s performance at the end of the evening. Those of you who read last week’s blog will know that Peter’s next single, to be released on 3rd February, uses one of my poems as its lyrics. I have been privileged to hear both the first recording and the final master of that track, so I know how beautiful and pure Peter’s voice sounds even when it has been untampered. I couldn’t wait to hear him perform live the songs he had written to incorporate Picasso’s poetry. I wasn’t alone. An impressive bunch of 80’s artists had gathered for the former Lotus Eaters’ contribution to the evening, including Brian Nash (Frankie Goes To Hollywood), David Ball (Soft Cell) and Nick Van Eede (Cutting Crew). A short time into Peter’s performance, I saw him glance over and smile at the person who had just stood come and next to me, Holly Johnson. I don’t know if I can do justice in describing not only what I heard but saw, as an exquisitely delightful interpretation of the work of one of Spain’s greatest exports was delivered by one of Liverpool’s finest. Sublime. Immersive. Emotive. All of the above, yet so much more. Late Saturday morning saw me doing my best Girl Guide impression as, fully prepared for what the elements might throw at us, I trekked across fields, laden with everything I might need for the day. Okay, so the fields were Sandwell Country Park in West Bromwich, and my ‘load’ was a festival chair, umbrella, waterproof jacket and several layers of clothing, but as a fairweather festival-goer, and with rain forecast throughout the day, this was me out of my comfort zone. I was undeterred by the prospect of a downpour, as the main reason I had chosen Let’s Rock Birmingham as my first festival of the year, was the opportunity to see Tiffany live, and she didn’t disappoint. Hearing her sing live was worth getting a soaking. Besides which, the sporadic showers meant my normally straightened hair reverted to its natural curly/frizzy state. I achieved an authentic Eighties look without even trying! From the moment Tiffany came on stage, singing the chart-topping “I Think We’re Alone Now”, she gave a first class performance. Including “Right Here” from her new album “A Million Miles”, and a superb rendition of “Sweet Child of Mine” in her set, my personal favourite was “Could’ve Been”, a beautiful track I’ve loved since its release in ’88. Standing a few feet away from the singer, as Ms Darwish delivered the song note perfect, was one of the day’s highlights for me. I say one because, with so many fantastic acts performing, it was an impossible task to choose an outright favourite. Jimmy Somerville was outstanding; Five Star gave a flawless, polished song and dance set. Go West’s Peter Cox was gorgeous and gravelly-voiced, as always; Martin Fry stylish and classy, treating us to ABC’s 80’s hits, as well as “Viva Love” from the “Lexicon of Love II” album. Dr & The Medics kicked the day off to a great start, and had the crowd singing along and dancing within seconds of playing; Holly Johnson provided a fabulous finale, performing Frankie Goes To Hollywood classics and solo tracks, including this year’s earlier release “Ascension”. As I said, impossible to choose. To name your favourite song of an entire decade is no easy task. When that decade is the Eighties, the decision becomes even harder as we were, at times, spoilt for choice. For me, the summer of 1984 was the pinnacle of the Eighties. With Frankie Goes To Hollywood topping the charts, and acts like Grandmaster Flash and Melle Mel rubbing well-padded shoulders with Nik Kershaw; as well as OMD talking loud and clear alongside Echo & The Bunnymen, music was at a diverse high. The summer of ’84 was also my first summer as a teenager, and evokes memories of lazy, sunny days at the beach, and trips to Dreamland in Margate, when it could still boast to have the biggest Big Wheel in Europe. It was also a time when I began to write prolifically. For all that associated nostalgia, but more importantly because it is an amazing, soulful track, my all time favourite song of the Eighties is “Closest Thing To Heaven” by The Kane Gang. Peaking at number 12, the song spent 8 weeks in the UK Top 40. During that time, I wrote to the band, asking what were their favourite Soap Operas (I like to think my interview questions have improved slightly since then!). Despite being at the height of their success, and having overloaded, hectic schedules at the time, a few weeks later I received the above publicity photo, along with a handwritten reply from band member, Dave Brewis. For those of you desperate to know what their favourite soaps were in the Eighties, the letter will appear in my next book, as will the answers to a number of questions I was able to put to Dave a couple of weeks ago. One thing that did emerge from my recent quizzing, and something I’d like to share with you now, is the band’s current status. The band reformed last September, for a one-off charity performance at Dave and Martin’s old school, Northlea in Seaham. The following month, a 3 CD edition of “The Bad & Lowdown World of The Kane Gang”, featuring demos, remixes and live performances, in addition to the 1985 album, was released. However, with all three band members working full time individually within the music and media industries, there are no current plans for any more live performances by the band. I am sure I’m not alone in feeling disappointed at being denied the opportunity to listen to their blue-eyed soul first hand, so I have a cunning plan…Maybe, just maybe, if The Kane Gang get enough “Likes” on Facebook and followers on Twitter (@TheKaneGang), they will be persuaded to give us another gig or two? For now, to remind you just how good they sound, and because I need no excuse to play this track, here is “The Closest Thing To Heaven”. BBC Music recently announced the results of their “Greatest Covers” poll, the winner of which was Pet Shop Boys’ “Always On My Mind”. The usual suspects, such as Whitney’s “I Will Always Love You” and Jeff Buckley’s “Hallelujah” were featured towards the top of the list of 50, with tracks like the rather superb “Girl, You’ll Be A Woman Soon” by Urge Overkill edging into the bottom half of the list. Although the list was an unusual mix of predictability and surprises (I never realised Elvis Costello’s “Good Year For The Roses” was a cover), there was one glaring omission. That was one of my favourite covers, Frankie Goes To Hollywood’s “Born To Run”, from their “Welcome To The Pleasuredome” album. Not only does the track perfectly capture the raw energy and attitude of the band, Holly Johnson actually sings the lyrics rather than slurring and mumbling his way through the song (cue the Springsteen fans’ complaints!). From a very young age, I have loved Art in all its forms. Whether it was my own early creations, which relatives dutifully received on every occasion I could deem special (basically any day ending in a Y! ), or my attempts to “improve” my environment, which included a full-length painting on my bedroom door of my then favourite group, Immaculate Fools, when I was 14 (my parents were very encouraging and tolerant), I have painted and created. However, in more recent years the creativity has been inched out in favour of appreciation, which is why I could not resist the opportunity of viewing a Banksy creation in situ. Banksy aside, there are a number of urban artists producing some fantastic pieces, but who do not receive the media hype of the elusive artist. One such artist is Terry Sue-Patt (TSP Hoodie). If the name sounds familiar, you were probably a Grange Hill fan when the programme first launched. Terry played the part of Benny Green, the sidekick of Peter “Tucker” Jenkins, and the first Grange Hill pupil to ever appear on our TV screens. Some of Terry’s work is inspired by, and features, his Grange Hill character. Exhibiting alongside the talents of artists such as Norwich-based David “Gnasher” Nash, and Lisa Richer (LisArt) in Brick Lane’s “Monty’s Bar”, Terry’s work is both accessible and affordable. Last year, I bought one of Terry’s “Benny Green” pieces, during his Grange Hill Exhibition at the bar, and it has hung proudly in my hallway ever since. I never tire of looking at it – surely a sign of enduring art. I love to discuss Art almost as much as viewing and having a go at creating it, and was in my element when I happened to encounter an Art lecturer, whilst working in a book shop. What began as a discussion about a local Eric Gill sculpture, ended almost as a confessional of our own artistic shortcomings. He admitted that he hates people looking over his shoulder at what he is sketching, when he works outdoors. I revealed that for about the last ten years, I have not finished any of the paintings I have started. Some may only have an square inch piece missing, but they re main unfinished. The lecturer’s theory was that in not finishing my paintings, I was preventing them from being judged. When a painting is finished, the artist is saying they are happy with the piece (or at least happy for it to be viewed), and therefore open to criticism. In keeping my work incomplete, it stopped it being criticized. Heavy stuff, but it made sense. In an attempt to get me past this fear of criticism, and to actually finish a painting for once, I thought I would publish some of my teenage artwork, which I did during the 80s. The punk was a school project, with the right half being cut from a magazine, and the left half painted by me when I was about 14. 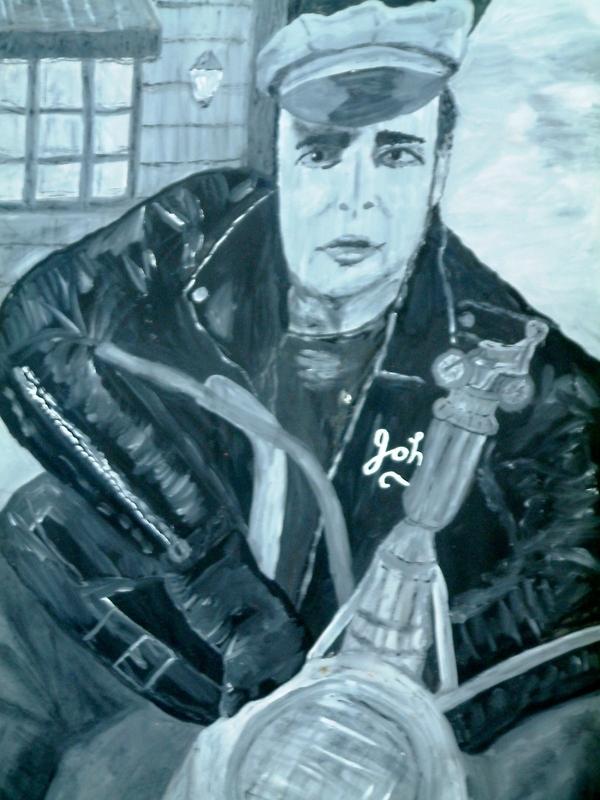 I painted the (lopsided) Marlon Brando shortly afterwards, during some time off school, when I had happened to watch “On The Waterfront”. I had injured my arm, and had to have it in a sling, which meant I painted Marlon right-handed (I’m a leftie). That’s my excuse why he’s wonky anyway, and I’m sticking to it! I hope that anyone who owned a copy of Frankie Goes to Hollywood’s “Welcome To The Pleasuredome” album will recognise my efforts on the right. Again, this would have been drawn during my mid-teens. It was one of the many, many music based pictures I drew or painted, and now it, and my other work, is out there for the world to see…Don’t judge me too harshly!